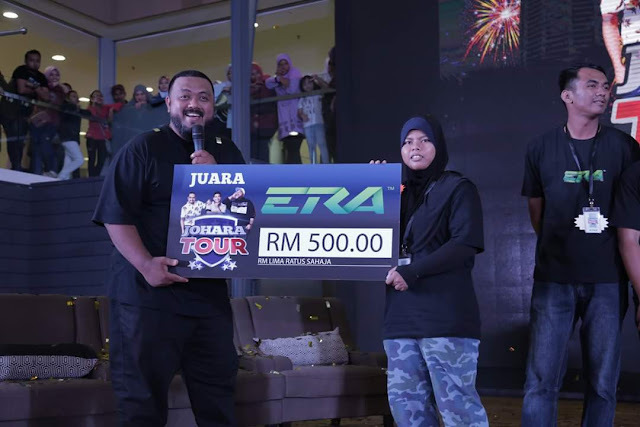 ERA.JE rdio station manage by Astro is celebrating their anniversary by organising 'Johara Tour' Campaign to meet and greet their loyal fans for the years that they have been on air. The tour starts in August 2018 with their main radio deejay Johan, Hanif dan Ray, Together with other celebrities touring up north to Penang and south to Johor Bahru seeking a winner for ‘U Gelak U Out’. In order to win, participants is to team up with Era.je radio deejay going against each other in a series of activity and the last team standing strong is in line to win cash at the end of the tour. Each participant will challenge each other to perform on stage with a random song to mime. Audience will be the judge, where the loudest applause wins. Participant would need to guess the name of the short clip video (music video/viral video/ movie) correctly. The one who gets most points at the end of the game, wins. So mark your calendar to not miss out on their tours 'JoHaRa Tour’ In Penang on 1st September 2018 and Johor Bahru on 15 September 2018. Don't miss out on interesting aktiviti and be able to watch enwrgetic performances and the chance to win great prizes on the tour with Johan, Hanif and Ray.